BRAND NEW/Softcover Book/Solar-Vision Publishing/Copyright 2010/40 Pages! You love fast food, and restaurant burgers but don't like the dent it creates in your wallet? Who says you can't enjoy the food you love at the convenience and privacy of your own kitchen AT HOME? All the while saving money! 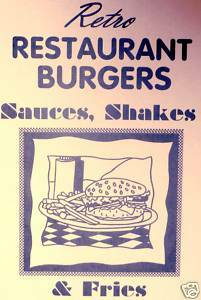 This cookbook easily shows you how to create FAST FOOD RESTAURANT BURGERS, Delicious SHAKES, Creamy SAUCES, AND Crispy FRIES for you and your family for years to come. This cookbooks is perfect for the fans of old fashioned 50's diner style fast food recipes as well as lovers of modern fast food!! !